I’ve created some new science-inspired work for a small group exhibition which will be opening on Friday 9th March at Newarke Houses Museum, Leicester. This is part of the University of Leicester’s British Science Week celebrations. Find out more about the project and exhibition here. The exhibition continues until 31st March 2018. Some of the Petri Dish Project will also be shown in the exhibition. My work is often around making ideas and concepts into visual form through textile and mixed media. My first career was working in museums, and this comes through now in my choice of exploring themes of memory, history and personal stories, usually taking historic objects or family history as my source. I was intrigued by the idea of telomeres, the ends of chromosomes having a role to play in ageing. This ties in with my previous work on genetics and other work around grieving, length of time expressed through linear pieces and of capturing ephemeral moments permanent through creating artworks. Visiting Dr Nicola Royle and talking through the work she does sparked lots of ideas of how I might develop new work around length, ageing and repair. I wanted to explore some of the words and ideas which are used in genetics research and their resonance in the world outside the lab. DNA is often referred to as strands, like hair or threads. I chose to work with this concept to create a new piece using long lengths of fine wool thread grouped and bound at intervals. Thinking about telomeres, the ends of chromosomes, gave me the inspiration to work with the ends of the thread, in this case knotted together in small groups. I was also intrigued by the role telomeres play in DNA repair and chose to represent this through a textile repair. The microscopic imagery of chromosomes uses a bright pink fluorescence to highlight telomeres so I chose a similarly-coloured darning thread and used to repair a silk handkerchief. 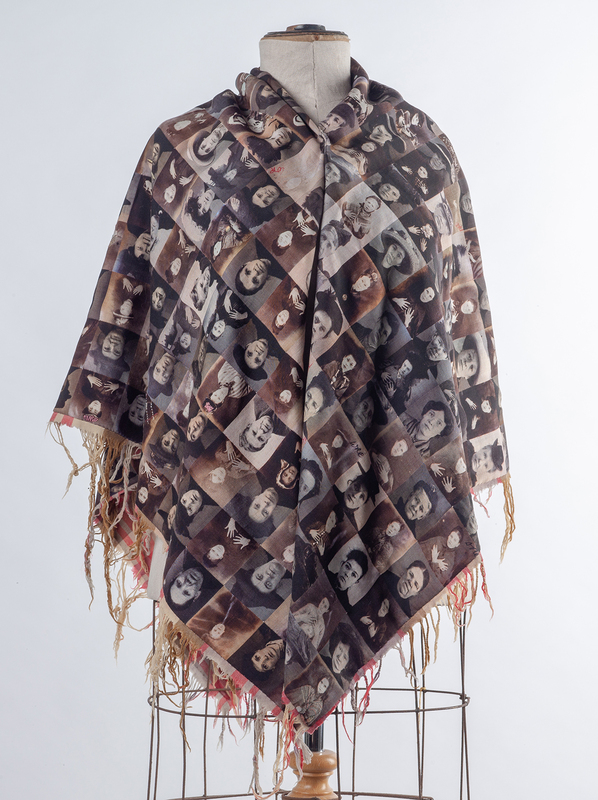 Alongside my research and workshops at Staffordshire Record Office, my Criminal Quilts project also includes a creative residency in the Fashion and Textile Department of Wolverhampton University. I included this in the project so I could work with students and staff to help develop the creative work and have access to their amazing studio facilities. I am in the process of setting up a student brief for students across art and design to make work for exhibitions based around the information and data which is growing from the archive research. I hope that working alongside a practicing artist on a live project with exhibitions and publications will be a great experience and some exciting and innovative work will be produced. Personally I am working closely with Senior Lecturer Jan Wrigley and Professor Fiona Hackney on both the practical, creative side and on completely new (for me) outcomes for the project including a symposium at the end of 2018 and academic papers. When I devised the project plan and funding application I intentionally created new ways of sharing the project beyond the usual exhibition and am excited by the possibilities which have developed to share and record the project in so many ways. I also get the chance to experiment with the equipment and facilities at the University including digital print and tufting, all of which is completely new to me. The screen print workshop has much larger capacity than I am used to as well so I hope that I will be able to make some larger scale work rather than my usual tiny, detailed hand stitched work. I even got to have a go with the embellisher in the machine room on my last visit and hope to use the Cornelly embroidery machine on another session. I was also charmed to find pages from my books adorning the machine room for student reference! Gillian and I spent our first full day at work as Artists in Residence at Leicester University Department of Genetics this week spending time observing in labs and extracting the DNA from a banana preparation to testing our own DNA later this week. For the next few weeks were are absorbing, observing, investigating, learning and getting to know the department as well as planning all the other parts of our project including schools project and exhibition. For me it is a visual and intellectual feast, I’m finding the details of the labs fascinating and so completely new it is somewhat mind-blowing. The joy of this research stage is there’s no pressure to decide what the finished work might be and it’s great to bounce ideas around with both academic staff and of course with Gillian as we begin to scope out how we are going to approach our creative work. I’m working on a new sketchbook with no fixed aim or direction yet which is very liberating. I am learning – fast- about the very basics of DNA and genetics, starting from knowing pretty much nothing, having not studied any science for 25 years! I’m overwhelmed by the generosity and support from the academic staff already and the enthusiasm shown for what must seem a pretty strange project to them.